My mother recently passed away. She was 91 and lived a rich, full life. She was a great cook and is certainly one of the reasons I spend so much time in the kitchen. A few years ago, she collected her favorite recipes as well as the favorite family recipes of her parents and her extended family (three children and 12 grandchildren). She found photos of each of the family members to put beside the recipes with some comments by her. Everything was copied and bound in handmade, padded binders. Everyone got a copy – very cool. This was one of the recipes from the “Family Cookbook”. 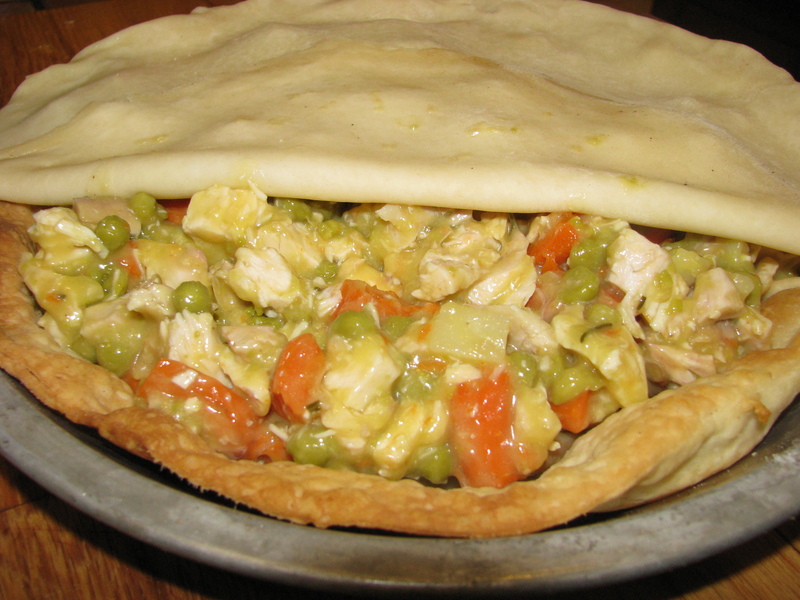 Chicken Pot Pie is a great way to use your leftovers. 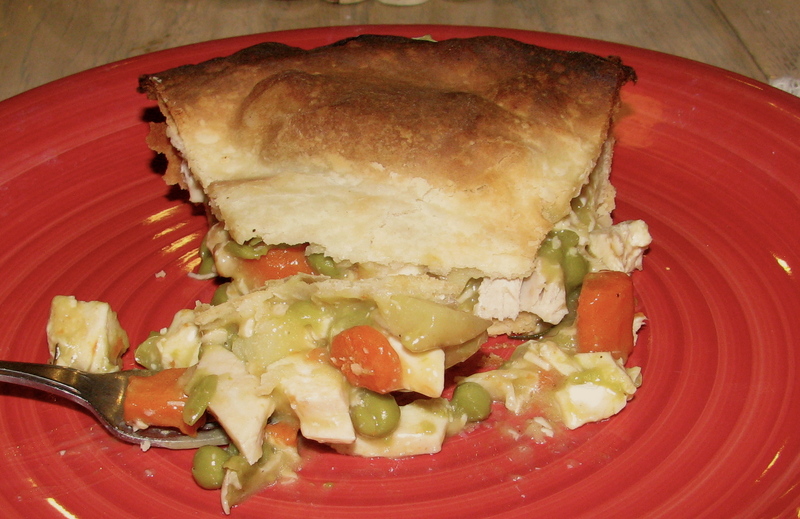 We had roasted a chicken two days earlier and had more than enough left to make a pot pie. Servings: 6 as a main dish, 8 if you have other courses. Gear: Standard pie pan – I suggest a nice ceramic pie pan since you will be serving the dish at the table. 2 cups of chicken – diced – you will usually have this much leftover if you have cooked a whole chicken earlier. If not, you need one large chicken breast, which you can roast in the oven for 30 minutes, cool and dice. You can add other things such as celery, onion or potato, but they all have to be cooked. Make a standard piecrust (see our One-Handed Pie Crust) about midday so it can rest in the refrigerator. Once you get into the habit of making a piecrust, it only takes about 15 minutes, so don’t be lazy. 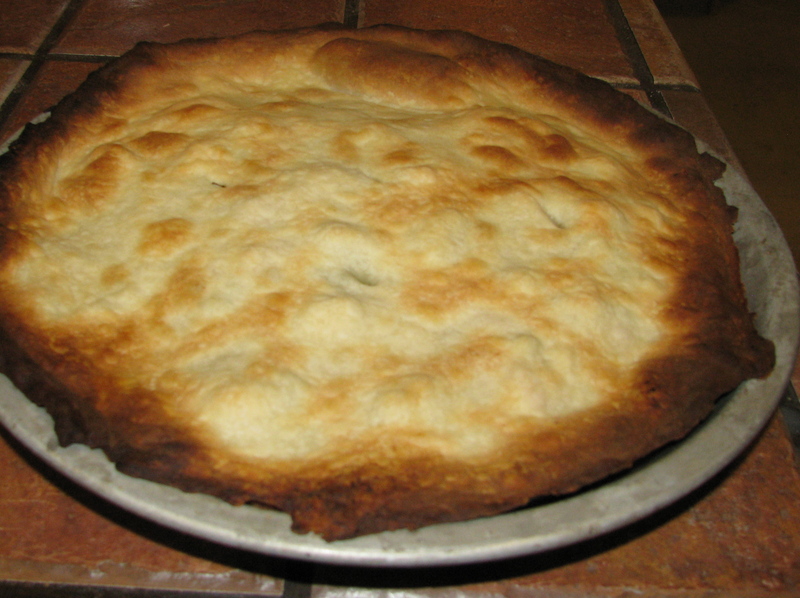 When ready to start to make the pie, divide the piecrust approximately in half with one piece slightly bigger. Put the smaller piece back in the refrigerator. Roll out the larger half so that it will completely cover the bottom of the pie pan. Grease the pan, spread the crust and, using a case knife, cut off the excess dough, which you can add to the dough in the refrigerator. Prick a few holes in the crust and bake for 10-12 minutes until it starts to turn golden brown. This “proofs” the crust and helps make sure the bottom doesn’t become soggy. While the crust is proofing, cook the carrots in boiling water for ten minutes. Mix all the ingredients for the filling in a bowl, making sure to add the salt and pepper. Let the bottom crust cool for a couple of minutes while you are rolling out the top crust. 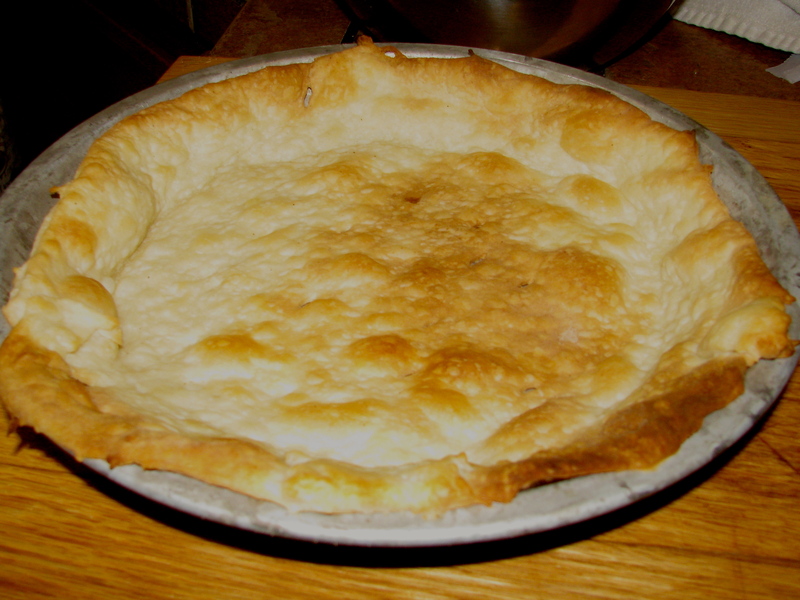 Add the filling and cover with the top crust, pinching the edges to form a seal. Make about five vent holes in the top and bake for 25 minutes until golden brown.